Macrocyclic peptides are very important in bioorganic and medicinal chemistry investigations. Synthesis and chemical modifications of existing antibacterial agents in order to generate novel macromolecules with better therapeutic properties are necessary. A series of macrocyclic pentapeptide Schiff bases 3-10 were synthesized from the reaction of Nα-dinicotinoyl-bis (L-leucyl-L-phenylalaninyl acid hydrazide) (1) and the macrocyclic pentapeptide ester (2) with selected dibasic amino acid and active reagents. All prepared compounds were tested as anti-inflammatory, analgesic and anticonvulsant agents. Some of the screened compounds exhibited better anti-inflammatory, analgesic and anticonvulsant activities comparable to prednisolone®, valdecoxib and carbamazepine as reference drugs. Macrocyclic peptides are very important and represent a fascinating area of bioorganic and medicinal chemistry investigations [1,2]. Synthesis and chemical modifications of existing antibacterial agents in order to generate novel macromolecules with better therapeutic properties are necessary . Peptides are function well as drugs due to their low bioavailability and rapid degradation within cells . In continuation to our previous work, the synthesis of some new macrocyclic peptide candidates from pyridine dicarboxylic acids with amino acids and screening of their biological activities were reported [5-11]. In view of these observations and continuation of our previous works in macrocyclic and heterocyclic chemistry, we have screened some synthesized of macrocyclic pentapeptides Schiff bases containing pyridine moiety and screening for their analgesic and anticonvulsant activities. A series of macrocyclic pentapeptide derivatives 3-10 were synthesized from compounds 1 and 2, which was obtained from 3, 5-pyridinedicarbonyl dichloride, according to the previous published procedures (Figure 1) [12,13]. A series of derivatives 3-10 were synthesized from compounds 1 and 2 in advance and screened as antimicrobial agents . Herein, we used these compounds 1-10 for evaluation as antiinflammatory, analgesic and anticonvulsant agents. 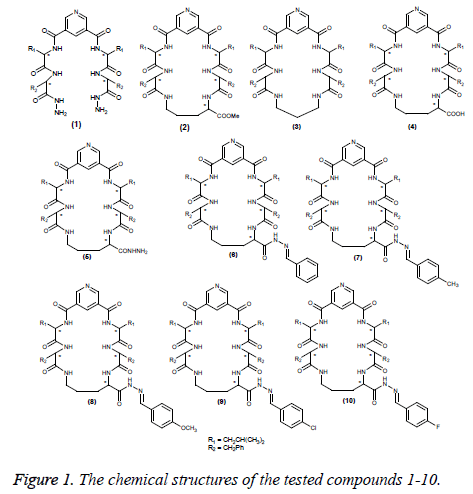 Figure 1: The chemical structures of the tested compounds 1-10. Initially the acute toxicity of the tested compounds was assayed via the determination of their LD50 (Table 1). All the tested compounds were interestingly less toxic than the reference drug (Table 1). The synthesized compounds were pharmacologically screened on male albino rats for their antiinflammatory potency (Tables 2 and 3) and on Webster mice for their analgesic and anticonvulsant activities (Tables 4 and 5). Table 1. Acute toxicity (LD50) of the tested compounds 1-10. *The doses tested were 25, 50 mg and carryout three determinations for each dose. Table 2. Anti-inflammatory potencies of the synthesized compounds 1-10 (protection against carrageenan-induced edema). Table 3. Anti-inflammatory potencies of the synthesized compounds 1-10 (Inhibition of plasma PGE2). Table 4. Analgesic activities of some synthesized compounds 1-10. Table 5. Anticonvulsant activities of selected compounds (as ED50 values) antagonizing yohimbine-induced clonic seizure, relative to the anticonvulsant activity of carbamazepine. Anti-inflammatory screening: For the determination of the antiphlogistic potency of the tested compounds, two standard tests were realized at 25 and 50 mg/kg rat body weight namely, the protection against carrageenan® induced edema according Winter et al. and the inhibition of plasma PGE2. The latter is known as a good confirming indicator for the carrageenan® induced rat paw edema . From the obtained results in Table 2, the protection against carrageenan® induced edema, these compounds 1, 2, 4, 5, 7-10 were found more activity than prednisolone®. Where, their protection percentage against carrageenan induced edema at two dose levels 25 and 50 mg/kg are 92.18/99.22, 88.35/98.56, 92.35/99.55, 93.18/95.45, 88.65/98.14, 92.17/99.20, 93.60/99.18, and 94.66/99.72, respectively (Prednisolone® 81/93). Additionally, from the obtained results in Table 3, we found the inhibition of plasma PGE2 for the compounds 1, 2, 4, 5, 7-10 more potent than prednisolone® at two tested doses levels 25 and 50 mg/kg. The inhibition percentage for potent compounds 1, 2, 4, 5, 7-10 was found as: 84.64/95.10, 86.26/91.62, 89.34/93.25, 85.26/91.62, 93.35/96.54, 92.28/96.48, 88.16/92.35 and 85.78/95.42, respectively (Prednisolone® 77.00/91.00). Analgesic activity: All compounds tested exhibited analgesic activities in a hot-plate assay (Table 4). The compounds 5 and 9 are most potent activities than valdecoxib, by nearly 110-140% (5 showed the most pronounced effect). Also, from the results in Table 4, we showed the analgesic activities of 1-4, 6-8, and 10 are 60-90% activities as compared to valdecoxib as standard drug (100% activity) (Table 4). Anticonvulsant activity: Antagonism against yohimbineinduced clonic seizures in mice is considered a predictive model of anticonvulsant and GABA-mimetic potential . From the obtained results in Table 5, the compounds 2, 4, 5, 8, and 10 were more potent than carbamazepine with relative potencies of 2.18, 2.05, 1.85, 1.84, and 2.12, respectively. Compounds 3 and 6 were devoid of anticonvulsant activity in the yohimbine-induced clonic seizures assay, while compounds 1, 7, and 9 showed interesting anticonvulsant activities. Their relative potencies are 0.75, 0.76, and 0.82, respectively with compared to carbamazepine (1.0). Synthesis, physicochemical and spectral data for the compounds have been reported in advance [12-14]. Animals: Biological experiments were conducted according to the ethical rules and animals were obtained from the Animal House Colony, Research Institute of Ophthalmology, Giza, Egypt. Approval of the institutional animal ethical committee for the animals studies was obtained from the Office of Environmental Health and Radiation Safety, ACUC Protocol 1096-5. All animals were allowed free access to water and were kept on a constant standard diet. Determination of acute toxicity (LD50): The LD50 for compounds were determined by injected different gradual increased doses of the tested compounds to adult mail albino rats, then calculate the dose cause 50% animal death, according to Austen et al. .
Anti-inflammatory activity: Carrageenan® induced rat’s paw: Procedure: Groups of adult male albino rats (150-180 g), each of 8 animals were orally dosed with tested compounds at a dose level of 25-50 mg/kg one hour before carrageenan® challenge. Foot paw edema was induced by subplenter injection of 0.05 ml of 1% suspension of carrageenan® in saline into the planter tissue of one hind paw. An equal volume of saline was injected to the other hind paw and served as control. Four hours after drug administration the animals were decapitated, blood was collected and the paws were rapidly excised. The average weight of edema was examined for the treated as well as the control group and the percentage inhibition of weight of edema was also evaluated. Prednisolone® (5 mg/kg) was employed as standard reference against which the tested compounds were compared. Calculation and evaluation: Thirty minutes after the rats are challenged by subcutaneous injection of 0.05 ml of 1% solution of carrageenan into the planter side of the lift hind paw. The paw is marked with ink at the level of the lateral malleolus, the paw volume was measured by a sensitive method developed by Webb et al. that calculated by interfacing a yridi Delta range top-loading balance with a micro-computer. Estimation of plasma prostaglandin E2 (PGE2): The experimental method which was used in analgesic activity has been adopted according to the reported procedure . Analgesic activity: The experimental method which was used in analgesic activity has been adopted according to the reported procedure . Potencies relative to that of valdecoxib were determined (Table 4). Anticonvulsant activity: The experimental method which was used in anticonvulsant activity has been adopted from Tyahr . The authors are grateful to Taibah University President and Dean Scientific Research for their support. Also, the authors acknowledge the College of Pharmacy, Taibah University, for collaboration and support to animals. Schreoder H, Leubke K. The peptides. Academic Press, New York 1966; 2. Goodman M, Felix A, Moroder L, Toniolo C. Synthesis of peptides and peptidomimetics, Houben-Weyl methods of organic chemistry (4th Edn.). Thieme, Stuttgart New York 2000; 2. Chu DTW, Plattner JJ, Kotz L. New directions in antibacterial research. J Med Chem 1996; 39: 3853-3874. Hirschmann R, Smith AB, Sprengeler PA. New perspectives in drug design. Acad New York 1995. Amr AE, Mohamed AM, Ibrahim AA. Synthesis of some new chiral tricyclic and macrocyclic pyridine derivatives as antimicrobial agents. Z Naturforsch 2003; 58: 861-868. Amr AE. Synthesis of some new linear and chiral macrocyclic pyridine carbazides as analgesic and anticonvulsant agents. Z Naturforsch 2005; 60: 990-998. Abou-Ghalia MH, Amr AE, Abdalah MM. Synthesis of some new (Nα-dipicolinoyl)-bis-L-leucyl-DL-norvalyl linear tetra and cyclic octa bridged peptides as new anti-inflammatory agents. Z Naturforsch 2003; 58: 903-910. Abu-Ghalia MH, Abd El-Hamid M, Zweel MA, Amr AE, Moafi SA. Synthesis and reactions of new chiral linear and macrocyclic tetra and penta-peptide candidates. Z Naturforsch 2012; 67: 806-818. Amr AE, Abo-Ghalia MH, Abdalah MM. Synthesis of novel macrocyclic peptidocalix (4)-arenes and peptido-pyridines as precursors for potential molecular metallacages, chemo-sensors and biologically active candidates. Z Naturforsch 2006; 61: 1335-1345. Amr AE, Abo-Ghalia MH, Abdalah MM. Synthesis of new (Nα-di-picolinoyl)-bis-L-valyl-L-phenylalanyl linear and macrocyclic bridged peptides as anti-inflammatory agents. Arch Pharm 2007; 340: 304-309. Khayyat S, Amr AE. Synthesis and biological activities of some new (Nα-dinicotinoyl)-bis-L-leucyl lnear and macrocyclic peptides. Molecules 2014; 19: 10698-10716. Amr AE, Abd El-Salam OI, Al-Omar MA. Synthesis of chiral macrocycles: I. Synthesis and study of cyclo (Nα-dinicotinoyl) pentapeptide candidates. Russ J Gen Chem 2015; 85: 1161-1169. Ibrahim AA, Mohamed AM, Amr AE, Al-Omar MA. Synthesis of chiral linear and macrocyclic candidates: II. Synthesis and investigation of 3, 5-bis-linear and macrocyclic tetrapeptide Schiff base pyridine derivatives. Russ J Gen Chem 2015; 85: 1506-1512. Azab ME, Amr AE. Synthesis of chiral linear and macrocyclic candidates: III. Synthesis and antimicrobial activity of linear tetrapeptide and macrocyclic pentapeptide Schiff Bases. Russ J Gen Chem 2015; 85: 1513-1521. Winter CA, Risley EA, Nuss GW. Carrageenin-induced edema in hind paw of the rat as an assay for antiinflammatory drugs. Proc Soc Exp Biol Med 1962; 111: 544-547. Herrmann F, Lindemann A, Gauss J, Mertelsmann R. Cytokine-stimulation of prostaglandin synthesis from endogenous and exogenous arachidonic acids in polymorphonuclear leukocytes involving activation and new synthesis of cyclooxygenase. Eur J Immunol 1990; 20: 2513-2516. Dunn RW, Fielding S. Yohimbine-induced seizures in mice: a model predictive of potential anxiolytic and GABA-mimetic agents. Drug Dev Res 1987; 10: 177-188. Austen KF, Brocklehurst WE. Anaphylaxis in chopped guinea pig lung iii. effect of carbon monoxide, cyanide, salicylaldoxime, and ionic strength. J Exp Med 1961; 113: 521-539. Webb EF, Griswold DE. Microprocessor-assisted plethysmograph for the measurement of mouse paw volume. J Pharmacol Methods 1984; 12: 149-153. Tyahr MD. The basal ganglion. Raven Press New York 1976; 293.